What if we knew each other a little better and were more likely to collaborate? I recently helped put together an effort to do just that for the Free Software Foundation, and I would love to cross-pollinate and connect it with other communities that have a shared mission and different skills. The basic idea of this campaign involves showing the faces and allowing the passionate messages of the people to be heard within a community: No one from the outside can feel like part of a community without connecting or identifying with someone inside the community. Your browser does not support the video tag. The video may be downloaded here. Communities that have grown around software platforms do not consist exclusively of the code developers we are likely to see and hear from, but many others; From people writing documentation, to trainers, translators, builders, etc. Often, this part of the community is not so visible. While the coders build software for the community, the non-coders keep a community running, growing, and evolving—and give it such a strong reason for being. How does a community recognize and reward all of it's members, regardless of how it is they have contributed? As the community, we are also it's organizers, and exposing all of us to each other enables us to combine our efforts and reach our potential. A visual representation can often assuage the fears that arise when people do not easily see themselves already represented in a community. At some point, we all ask Where do I fit into the picture? Do I see anyone like me in there? What do these people do and what do I have in common with any of them?. This campaign aims to help answer those questions by directly introducing the community members. What would you do if you saw a picture of someone from your community on a website? Not only on Facebook or Twitter, but featured on a tech website, a site you go to for information? A lot of us would click on the image. How has Free Software changed your life? How is Free Software changing the world? You can easily adapt this campaign to your community by changing the name of it to your specific affinity or community. In this case, the Free Software Foundation is calling it "What's Your Free Software Story". Members can be asked to send in their own videos speaking to the two questions and add value to the campaign as it grows. Any member of the community can capture videos at events and community gatherings. This campaign will visualize the diversity of community members around the world, and the people that are deeply involved in making it all happen. The video at the start of this article is the first of the campaign by the Free Software Foundation. Launched in January of 2016, it will continue to evolve with members being asked to send in their video stories. The free software movement is a global community based on freedom in the use of technology. This diverse community is made up of coders, writers, designers and others who make and promote software that respects our freedoms. 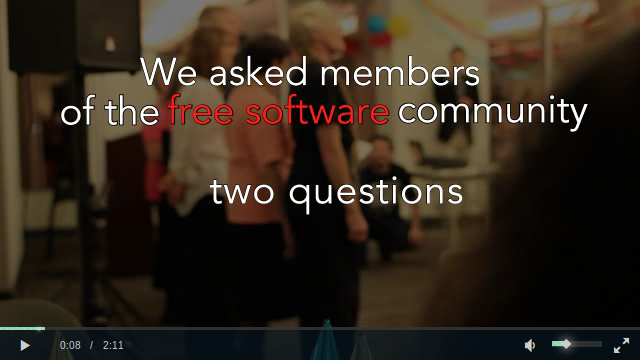 The title of the campaign is "What is Your Free Software Story?" and its hashtag is #freesoftwarestory. This campaign has worked before. In 1997, on my first community website, I started a version of this campaign by asking members to send us their photo - by postal mail. The photo was then scanned and posted in a prominent place on the front page, allowing people to click on the image which was linked to a short biography of the person - we did not have access to video on the web yet. You can see some of the campaign preserved on the Internet archive website. A networked community, where people are contributing to a larger community effort, encourages people to share ideas and knowledge freely. Connections grow when people see people doing things and there is a place for them to join in the doing. Creating a venue and allowing people to meet on their own terms is better than introducing them at times. Discovery can be a big part of welcoming diversity at our own pace. Working together, local community strategists and free software developers can build things that are bigger than themselves. Ideas become realities that improve lives. Free software developers and free software users, working together, can develop new tools for enriching the lives of all ...but first they must be introduced to each other and realize their common goals. Intending to cross-pollinate the Free Software Foundation community with other communities that can or do use free software, I am seeking to implement this campaign on several sites that already have robust communities seeking to network and make long-lasting connections. In conclusion, this campaign can be customized for any community and there are no set milestones. Here is an example proposal of how it could work in the Drupal community (slideshow). We already have diversity, let's show it, and let's grow it! If there are two people on planet Earth that truly understand freedom and human rights, I believe it would be Noam Chomsky and Richard Stallman.